because we have a close relationship, we live together as his parents work away from home. my mother sorts everything out for me. my mum started complaining that she got a backache from her sleep. The older I grow, the more involved I get with domestic chores/matters. or if my nephew is getting the "right" sleep for healthy growth. he doesn't get enough sleep. life happened, age happened, adulthood happened. More responsibilities, more wearies, less sleep. I have slept on different hotel beds while I travel and work in different countries. Nothing beats the Goodnite mattress I have at home. Now it's even better with another new Goodnite mattress. I don't think I'd ever seen such a thick and solid mattress before this. It looks solid but it's actually moderately soft to sleep on. I always go for the medium soft range. Yet, it's not too soft with its poised firmness that's great for spinal care. Heard of the Princess and the Pea story? I think I won't be able to feel the pea with Eternal Love laid on top of it. our unique shape to help provide personalized back support. minimize partner disturbance to ensure a good night sleep. Delightful sleep with accurate pressure point relief. 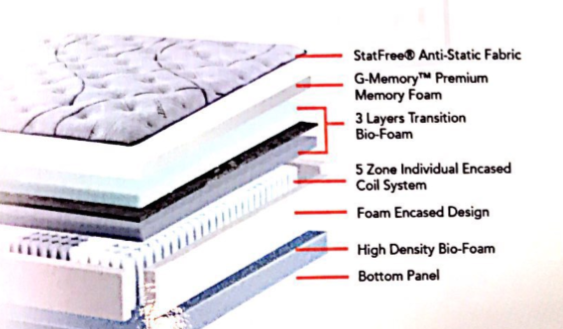 Let's talk about the anti-static sleep system. It sounds very geeky but I read up about it. Eternal Love is woven with carbon thread which is as thin as hair to discharge body static. It's scientifically proven to extract electron and eliminate body static effectively. This Belgium technology draws harmful static electricity and neutralizes them into the air. Long lasting, reduce voltage difference and bring you sweet sleep. Sometimes when you're over exhausted and you don't get your quality sleep. Now, Goodnite's Statfree® Love Series will help you to say goodbye to static shocks. Can't wait to enjoy all the parks that Eternal Love is to offer. Free from static, headache, sleeping problems and bounce back from fatigue quickly.